As many of you know, we three are in Africa. 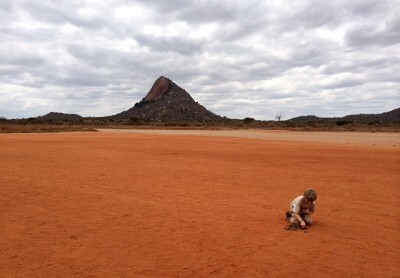 This is Lysander in Tsavo where Lysander (above photo) found rock amusements in the deep sienna earth. Barely managed to send these photos out for posting (no connectivity!). Tsavo is a region of Kenya located at the crossing of the Uganda Railway over the Tsavo River, close to where it meets the Athi River. It is derived from a Maasai word “sabuk” (pronounced tsavok), which means river. The Maasai called the Tsavo river, “Engare Sabuk,” meaning a big river. Samburu! The Samburu National Reserve is north of Laikipia, the hot, dry, relatively low country (around 800m above sea level). Kenya’s vast northern deserts and semi-deserts is the traditional homeland of the Samburu people, who were drawn to this region by the reliability of the Ewaso Nyiro, northern Kenya’s biggest and least seasonal river, for watering their herds. The wildlife is plentiful here for the same reason – dozens of species of plains grazers and browsers gathering in the thick acacia and doum palm forest along the river banks to drink and seek shade. 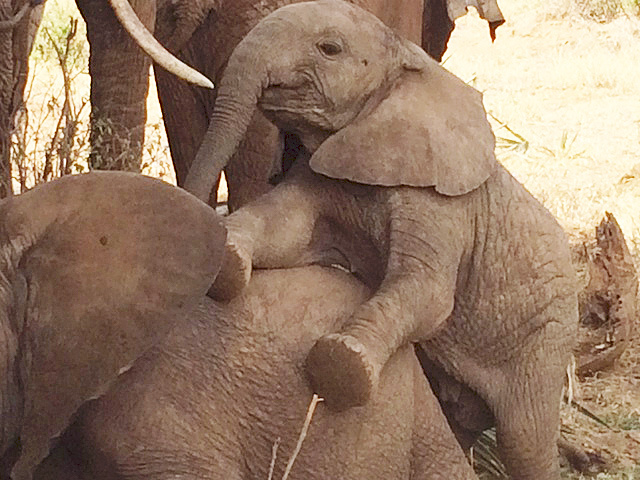 And look at what we’ve found…baby ellies. 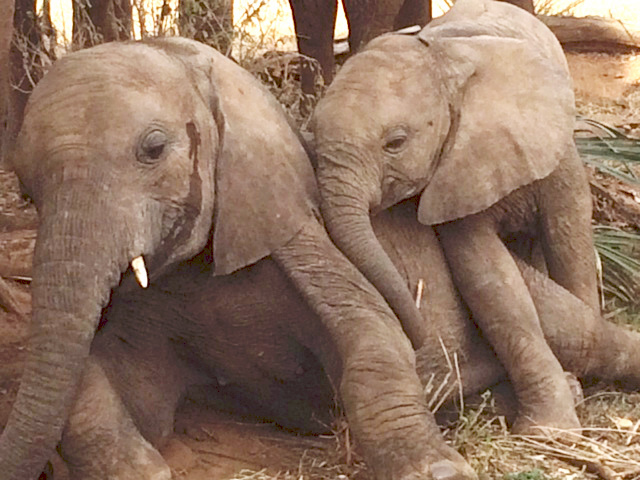 After last weeks tragedy – the death of Satao, the world’s largest elephant killed by poachers – the joy is so deep to see baby elies at play that we can scarcely breathe. It’s a family group in Samburu along the Ewaso Nyiro River. The family, consisting of mothers, daughters, and young ones, is resting in the shade of an acacia, and getting relief from the midday sun. They will later head down to the river for a drink.